A couple of KUNTZ LAGER BEER s.
This one from Scott Jordan's table i got when i set my camera on his acrylic display cube. 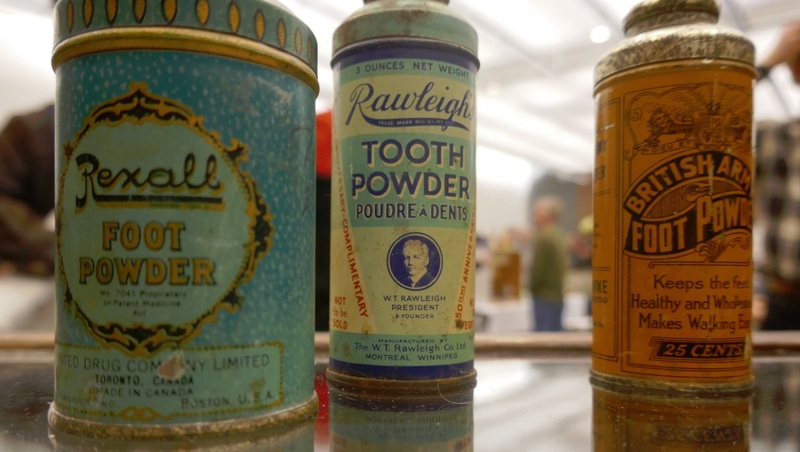 These medical powder cans were on top. My camera tried to find WiFi a few seconds later.. 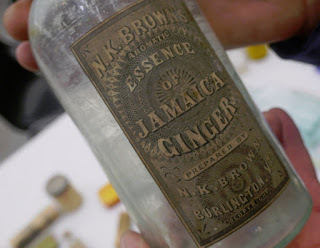 I will probably use this Jamaican ginger essence bottle (also property of Scott Jordan) image - this is an example of a picture for which i extended nohope when I snapped it without flash, and that usually means a slow shutter speed and blur . . . But it came out crisp. Its a slow load today.. be patient. Basement waterproofers who dig trenches around old homes in historic regions of Toronto very often find valuable antique bottles and early Canadian pottery - that's not a new story. 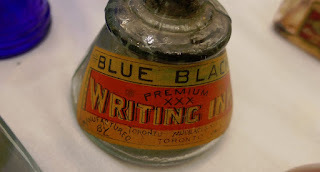 Right here on Dumpdiggers blog there have been more than a few accounts of Toronto area waterproofers digging up remarkable relics, while on the job. Indeed, it was one of these existing narratives that brought another such tale into this temporal tabloid. Chris Cavan from City Wide Group Basement Waterproofers in Toronto struck glass and emailed Dumpdiggers. 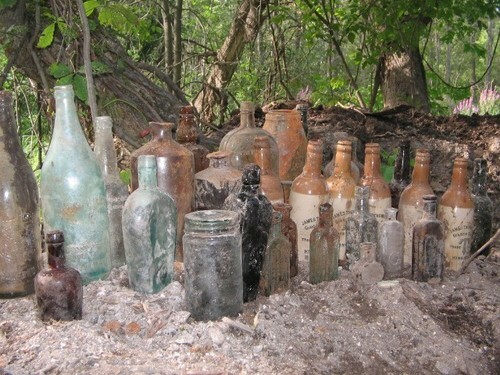 People who collect antique glass bottles, especially diggers tend to poke around online and look for history related portals where their dug specimens maybe depicted and described in greater detail. So it was while researching his bottle booty that Chris Cavan happened across the Dumpdiggers' blog and reached out for help. After some excited emails with photos, Chris invited us out to the CWG headquarters to examine and elaborate on the history of his burgeoning bottle collection. Water damage can wreak havoc on basements, and the mold that forms in moist environments can ruin an entire house. City Wide Group Inc has been waterproofing Toronto \homes for over fifty years. The process requires digging deep trenches around the foundation walls of older building to access and seal up century-old cement. Its when his workmen are trenching close to the house that Chris keeps careful eyes on the soil, and he's trained his ears to detect the tell-tale 'tink-tink' sound of a spade shovel striking glass. If he sees broken bottles and pottery shards in the dirt piles, or even white furnace ashes, or if he hears the tinking sound of metal on glass, then he springs into action and shoos away staff members to take up the shovel himself. In addition to the silk screened 12 oz Pepsi Cola bottles from the 1960's and 1970's , Chris's bottle collection includes some patent medicines, horse liniments, milks, and a quart sized Milk of Magnesia in a rare 'bright' shade of blue. 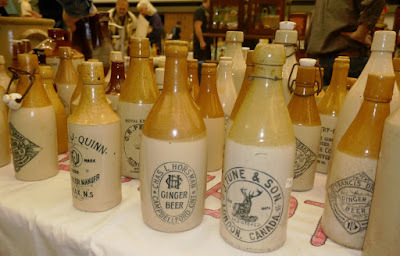 Chris also has old stubby beers, lady's leg liquor bottles, brown and green three piece wine bottles and a clear palm-sized pumpkin-seed flask. 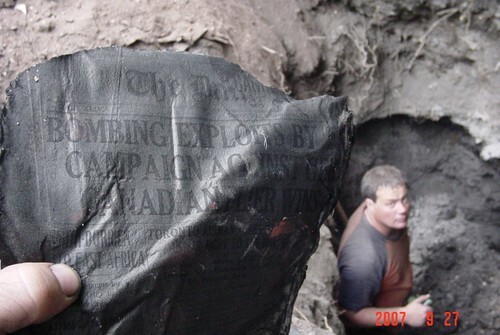 The sister of this photo below was used later by Lori Bosworth of Torontonicity in her piece about Toronto Tradespeople who find Treasure on the Job which I gave to her along with Chris's story when she asked about some other pictures for the piece. Waterproofing your property becomes necessary when the foundation begins to leak or let moisture through, allowing it to deteriorate. House foundations can rather suddenly spring a leak for many reasons, most commonly changes on the surrounding property. A common cause is a congested weeping tile system where the weeping tile can longer flow due a blockage of debris, soils or tree roots. Horizontal or vertical cracks in the foundation, or a separation of blocks can make voids where the foundation and footing meet, and this of course allows water to enter into the basement. Add to that reality, that simple fact that many foundations were not waterproofed properly during the construction process, particularly older buildings. Now you see why City Wide Group is so busy, particularly in the springtime. 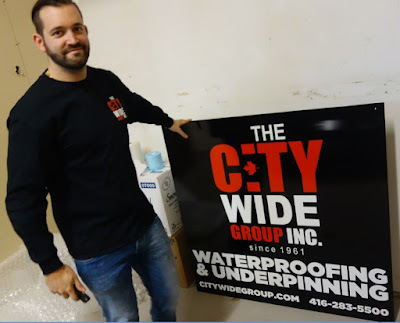 City Wide Group has been waterproofing foundations for over fifty years. His operation is one of the longest running and most experienced waterproofing companies in Toronto. Their track record proves they use the best of materials and procedures to waterproof any type of foundation for life. 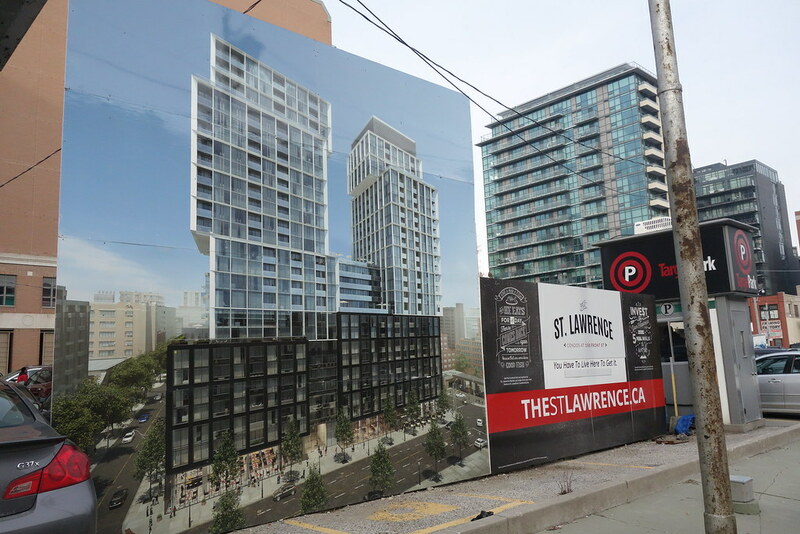 The St Lawrence neighbourhood is getting a 'Residential Rebirth' as per Toronto Waterfront Magazine, and that means excavators will soon be cracking through the asphalt and digging deep holes down through the history of the city to make the necessary underground parking garages. And that gets Dumpdiggers excited. 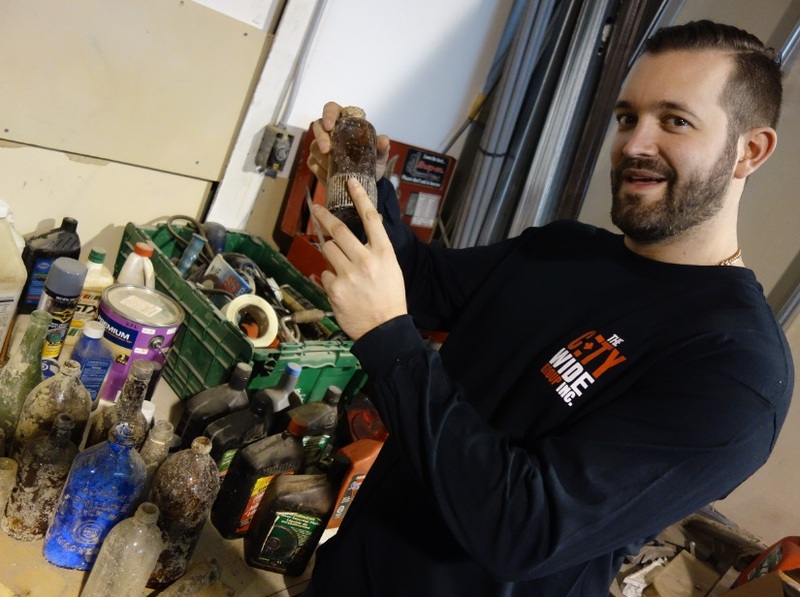 When historic property changes hands, City administrators often hire professional archeologists to poke about and recover artifacts in the hopes of making a 'Toronto Museum' someday. Below is a picture I snapped on 16 Jan 2017 of the archeological dig happening on the site of the St Lawrence Market's north building. For years this was the site of a vegetable produce market on Saturdays, and I believe there was an antiques market on Sundays. Or was it the other way around? I forget exactly, but I do know that I shopped for antique bottles in this building, and there's a blog post about visiting the spot with Abel DaSilva somewhere in the archives here on Dumpdiggers. This dig is happening before construction starts on a mega mall vendor complex which some experts, John Lorinc included, have pegged at costing just over ninety million dollars. That seems cheap - look at this thing! 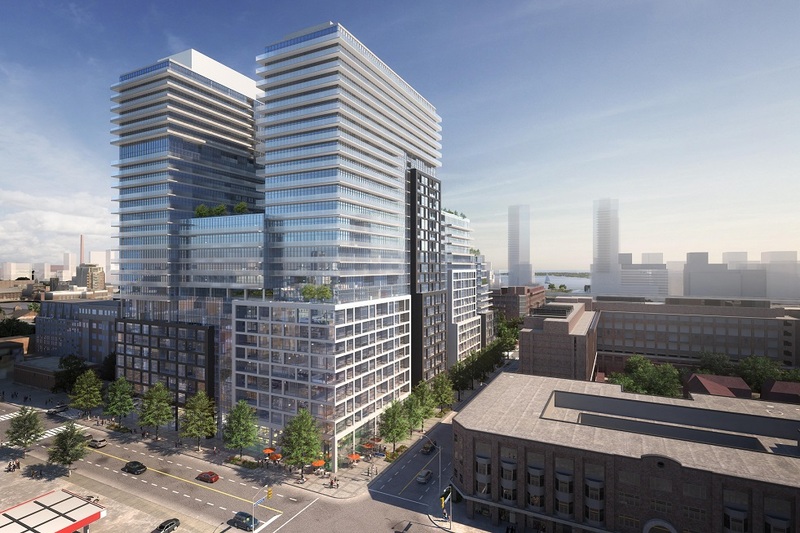 This complex, plus construction on the north side of the Distillery District plus the new condo towers at Esplanade and Yonge are pushing developer interest in the St Lawrence neighborhood. Properties in the downtown core preferred bits in a premier matrix of pre construction condominium investments in the city. Extreme property development in Toronto is commonplace as dozens of skyscrapers are erected all across the GTA every year. But the two futuristic-looking monoliths described next are special. These giant concrete condo towers, both scheduled to begin construction on Front St E this summer, are situated on two of the oldest lots in town, and even appear on the very first maps. Click the pictures - they expand. 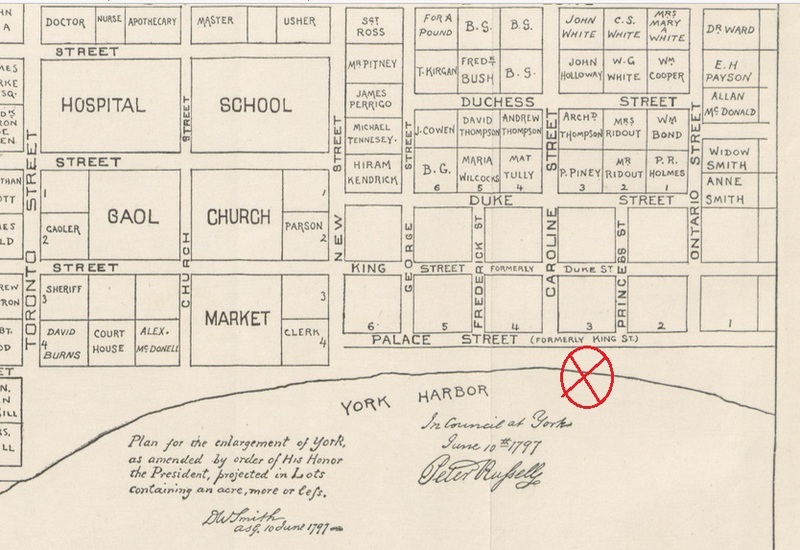 The picture to the right shows John Graves Simcoe's famous 1797 sketch of the Settlement of York with the present location of Time and Space condos clearly marked. You can see it's located right on the shoreline of the original grid. This graphic is borrowed courtesy of the Time and Space condos website's Time Traveler story from which I've re-purposed some other images and observations for this blog. I'm writing this post on Dumpdiggers as a community alert for shovel ready relic hunters and more refined collectors who prefer to deal directly with backhoe operators and excavation company owners (to buy dug bottles and bits at best prices). 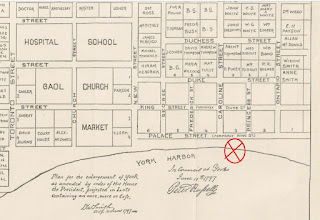 Lastly this is a story about the evolution of Front St E and what amazing things might be lurking under ten feet of top soil, buried a few hundred years under the rest of Toronto's history. 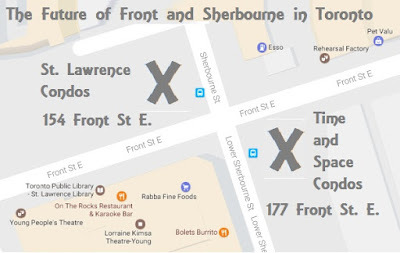 Anyone comparing the two map excerpts will notice that Front St E was originally called 'Palace St' and was a waterfront expressway toward the site of the first Upper Canada Parliament Buildings. It was called 'Palace St' because it was the way toward the 'Palace of Government'. 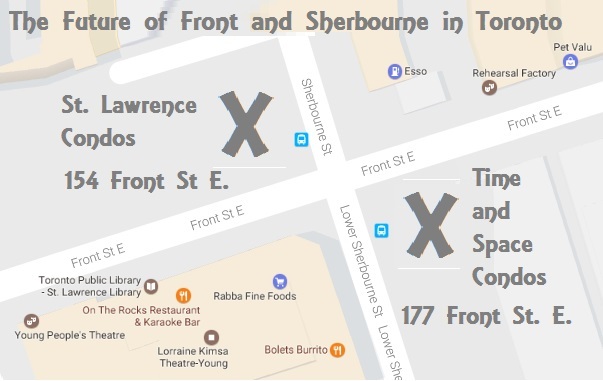 In a recent article about the past, present and future of Front and Sherboune appears in Toronto Guardian 21 Jan 2017 and the author states that anyone walking south down Jarvis, George, Frederick, Sherbourne and even Princess will notice a pronounced dip down right after Front St.
You can see the sudden 'dip' downwards in this image below that I snapped on 16 Jan 2017 of the south west corner of Front and Sherbourne as it appears today. 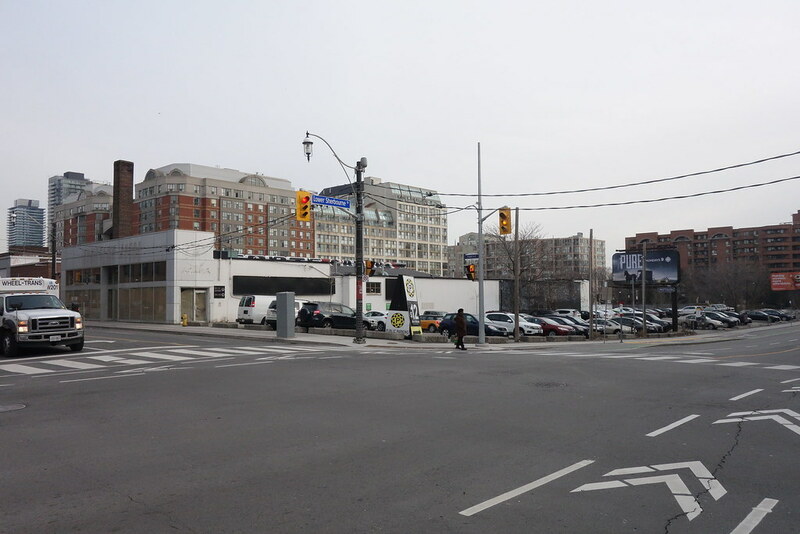 There was an Acura car dealership and Sobey's grocer store here not too long ago. See that smoke stack? Keep an eye on it. Go back forty years... Newsome and Gilbert Ltd. printing plant was located at 177 Front St E in 1972. The old smoke stack is visible back then, but does not appear to be connected to the building. 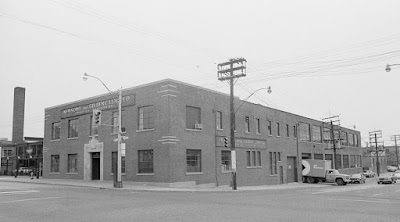 Newsome and Gilbert made high quality legal stationary for law firms across Canada and this facility probably employed a hundred people in the area. It was a modern printing plant and didn't use steam power but rather it required hydro electric power as evidenced by the many spars on the pole outside the building and only three spars on the pole at the corner in the foreground. Go back farther - here is a sketch from 1893. 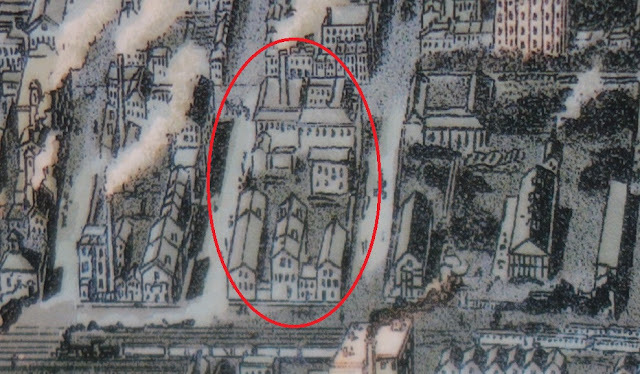 Now on the 1880 Goad Fire Insurance Map, you can see the center of the complex is being used by Lyman Bros Chemical Works. 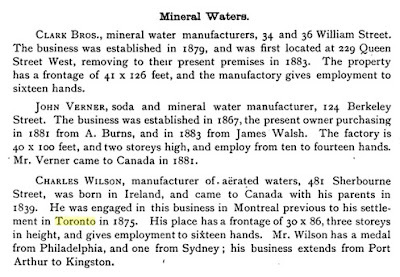 Lyman was listed in the 1851 Canada Business Directory - LYMAN, BROTHERS & Co., wholesale druggists, manufacturers and dealers in dye stuffs and clothiers’ materials-also in paints, colours, linseed oil, putty, &c., and importers of perfumery and chemicals, St. Lawrence buildings, King st., east. (the location of the retail store). An environmental study for 177 Front St E Toronto dated November 20th 1989 by Trow, Dames & Moore For Arnon Development Corporation reports the findings of a soil quality assessment study in which seven (7) boreholes were advanced to various depths across the site. They found "..an upper fill layer approximately 4 m thick on the west portion of the site and 3 m thick fill layer was identified on the eastern portion of the property. The fill generally consisted of sand and silty sand with brick fragments, cinders and wood fragments. At some locations the fill was observed to have a black colour and hydrocarbon odours. Shale bedrock was encountered approximately 7 m - 7.5 m below ground surface. " Here's what's coming to the site in 2017. 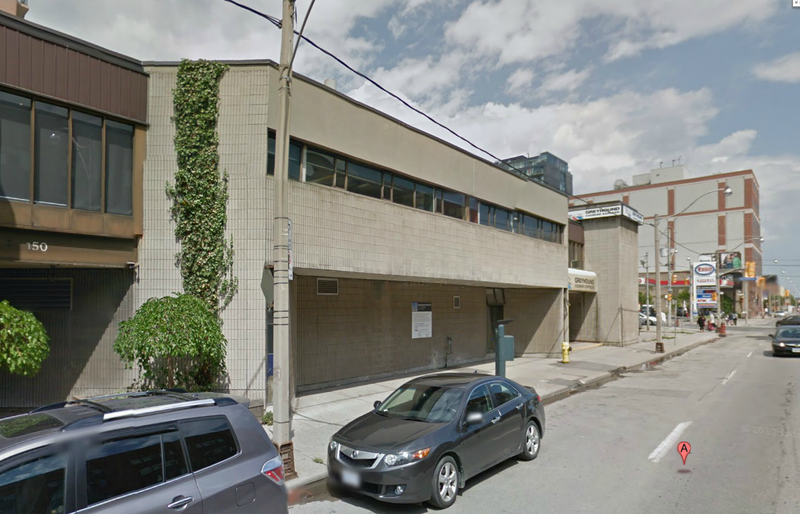 Time and Space Condos at 177 Front St E.
The other property that Dumpdiggers should be aware of is directly across the street, on opposite corner at 158 Front St E., the development is called St Lawrence Condos. The St Lawrence Condos at 158 Front St E has an advanced design with a ‘staggered blocks’ style appearance that's certain to turn heads. This is what the future looks like today. A photographer standing in this spot five years ago would have seen the Greyhound Bus Station that was just here. Demolished in 2011, that structure was built in the mid 1960s and for fifty years it was a prime conduit through which many people arrived in the city for the first time. Close to the same spot, facing the same direction seventy years ago, an unknown photographer captured this street scene below. Roy F. Day was a locksmith - The B/A sign is the mark of the British American Petroleum company. 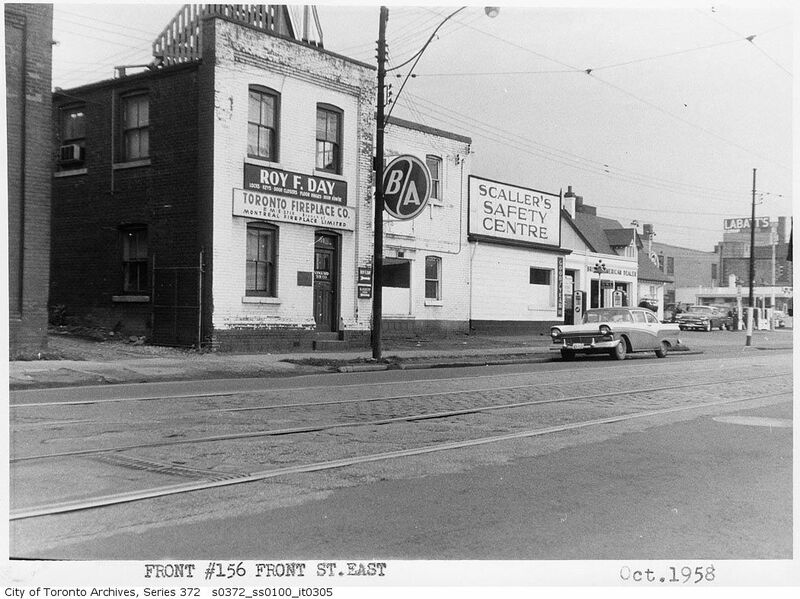 Behold there was a gas station / automotive service station on both the northeast and northwest corners of Front and Sherbourne back in 1958. (there is still an Esso on the NE.E. corner today) Scaller's Service Station started in the 1930s with some connection to the nearby British American oil company. The business would have removed or greatly disturbed the archeological record of the site when they dug their fuel tanks. I can only imagine what they unearthed. 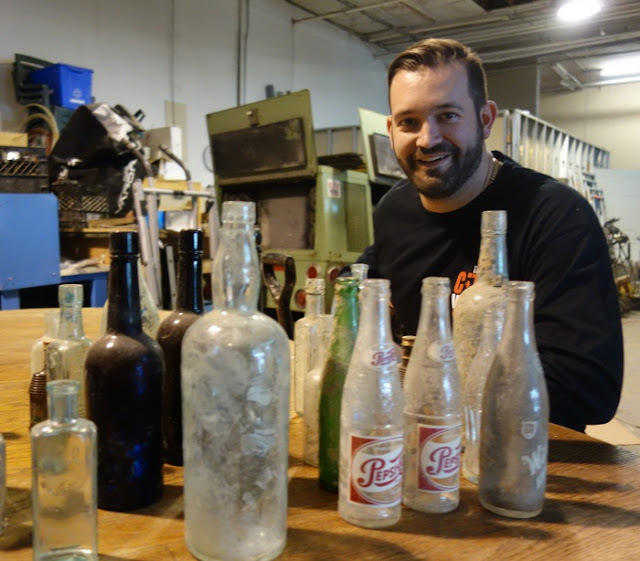 Let's remember this old section of Toronto is where dozens of good bottles (highly collectible) are being filled with original contents in the 1880s. King St E is thick with druggist and apothecaries including Dr. Chase and Lyman Bros etc. Do you collect soda or mineral water bottles? The original bottlers are all around this property in the 1890 Industries of Canada book. 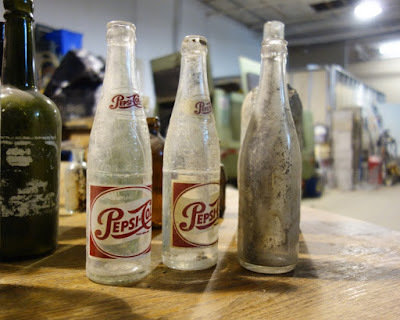 If the diggers find a privy pit it would be fascinating to do an archeological investigation of that and count the soda bottles and see which brand of local soda pop was the most popular (or least recycled) at the time in Toronto as dated by other relics found in the privy. 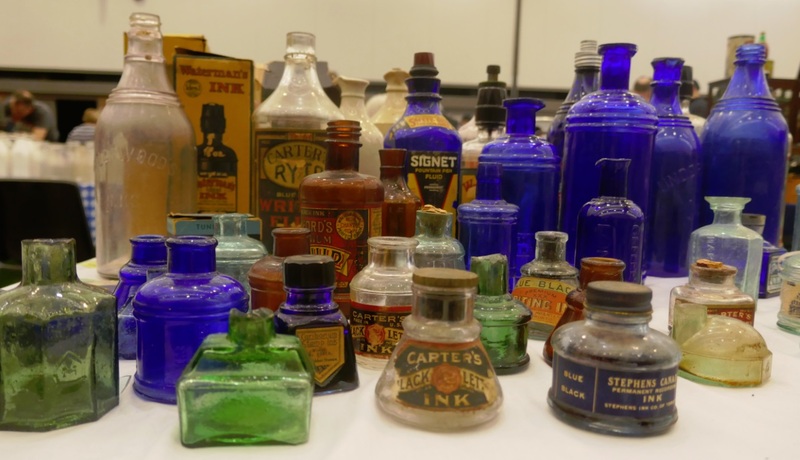 the property was surrounded by retail chemists, druggists, perfumers, soda pop manufacturers, breweries and distilleries back then and for a hudred years prior. 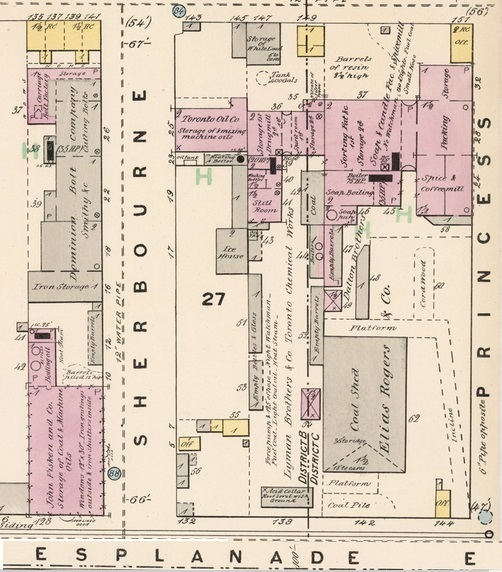 PDF - There's a report done by Archeological Services Inc on behalf of the city of Toronto for 154 Front St. E and the information inside is solid gold. The document recalls the original Toronto Purchase and lists the payment terms and treaty irregularities. It lists the population of the city at various ties throughout the 1800s and also there's a complete list of owners for 154 Front St E from 1833 - present day. 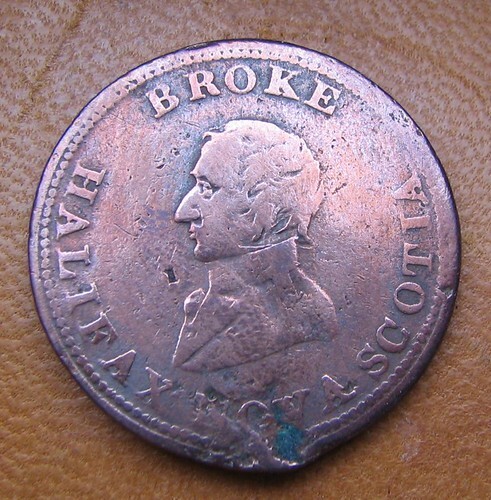 1833 Back when the road was still called Palace Street, a famous gentleman named Thomas Mercer Jones Esq., who was one of the Commissioners of the Canada Company lived at a house on the lot. Ten years later, in 1846 a man named Lawrence Coffee, who was a flour dealer, and Abraham Koplik, jeweler were on the site. Ten years later, in the middle 1850s, Boyd and Armstrong started a hotel at what is now 154 Front St E and called it the Grand Trunk Hotel which I suspect rented rooms on long term basis as the census records are thick with occupants' names from this point forward. The residents are middle aged blacksmiths, flour dealers, and pork packers who probably worked across the street at Wlliam Davies pork packing plant on Frederick St - that building still stands today too. The Grand Trunk Hotel is called Ontario House in early 1870s and then becomes William Lennox's Hotel in 1875. Where there was a lodging house there usually a deep privy and so I've no doubt the property is loaded with little pockets of antique glass bottles today. 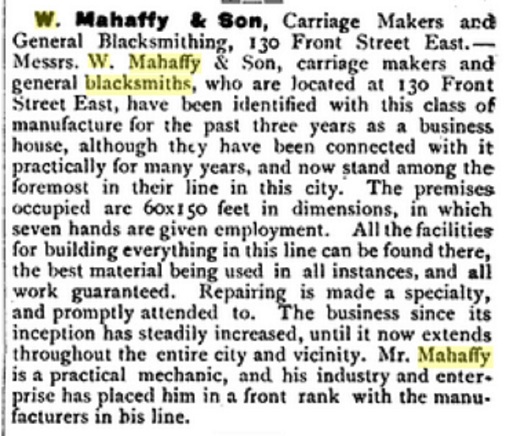 In 1895 we see the first mention of William S. Mahaffy as a blacksmith. A few years later he's listed as 'carriage manufacturer'. Same as H.A. Wickett Co. Ltd., general contractors in 1930. Wicket specialized in demolition afterwards - the Wicket Demotion company appears after 1940, along with Roy F. Day, locksmith. In 1957 The Dominion Linseed Oil Co. Ltd. had some facet of their operations here at 154 Front St. You can read all about their historic buildings on the other side of town. The Dominion Linseed Oil Co. Ltd on Wabash (at Sorauren). In 1965 the Hart Battery Co. Ltd. was here along with Precision Air Conditioning Ltd., sheet metal contractors and the Scaller Service Station which was part of the British American Oil distribution network. And we all know what's coming. In the summer of 2017 I will be there interviewing excavators, taking pictures, and maybe even buying bottles and relics from the excavators at the gate. Let's marvel at the new trend toward making and maintaining office lobby museums. 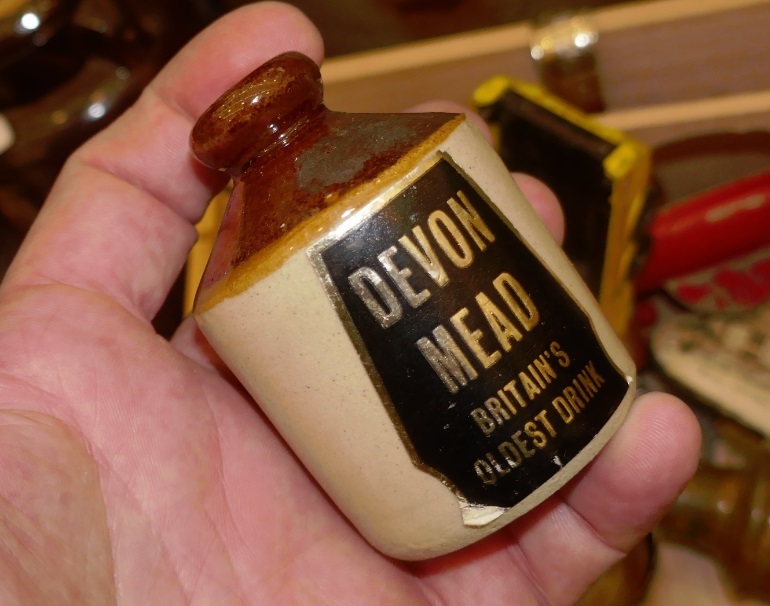 When culturally clever merchants keep curious collectibles in their office lobbies and meeting rooms, the relics help convince visitors that the host business is historically important to all humanity. Storied items are key to corporate myth making; venerated implements can spark conversations that cause executives to be reflective and have more pride in the employer and more passion for their work. Having obsolete industrial machinery on display, or primitive scientific apparatus preserved under glass commemorates decades of experience and symbolizes expertise wrought from empiric success. Such is the case at Lorpon Labels custom label printing in Toronto, Ontario where I found a Baltimore #9 Printer on display in their front office. 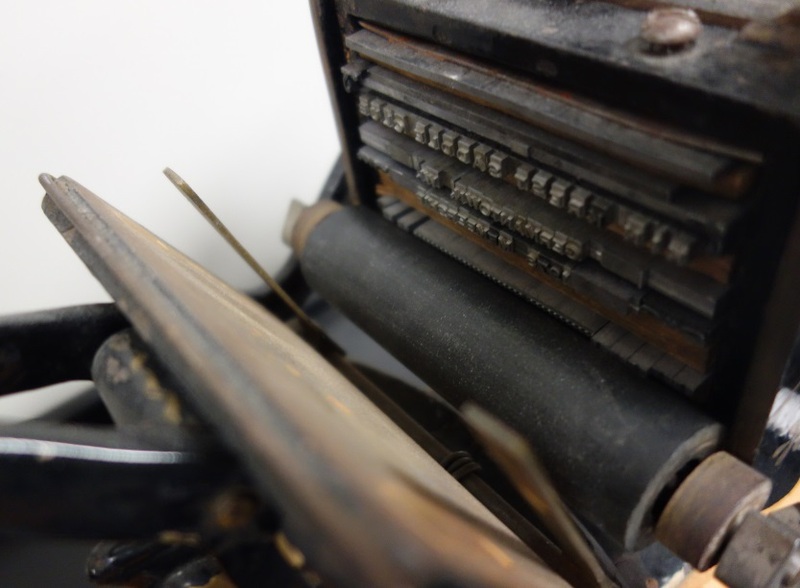 This is a relic from the 1880s and its still hard at work today, but not as a printing press. 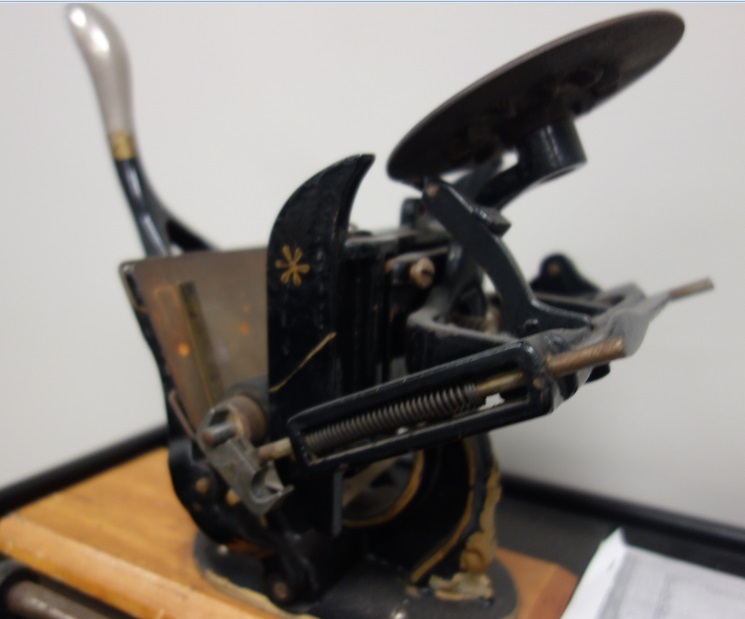 The Baltimore Printer #9 was a 'rail press', which is a modern term used to denote this type of printer where the action centers on a hand lever used to work the press. 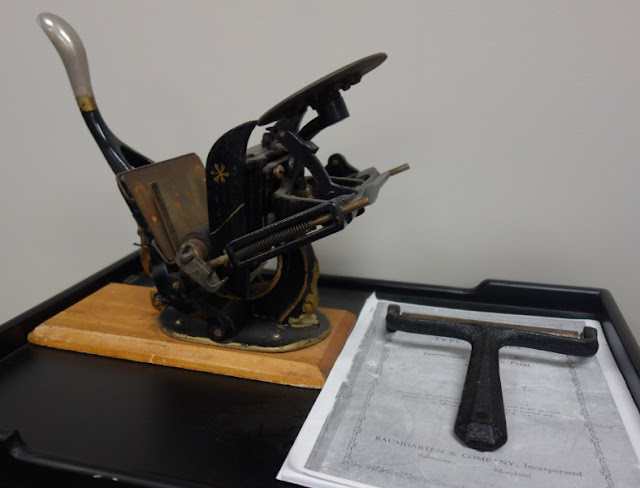 In their time these were called 'lever presses' and were the simplest printing machines available for purchase. 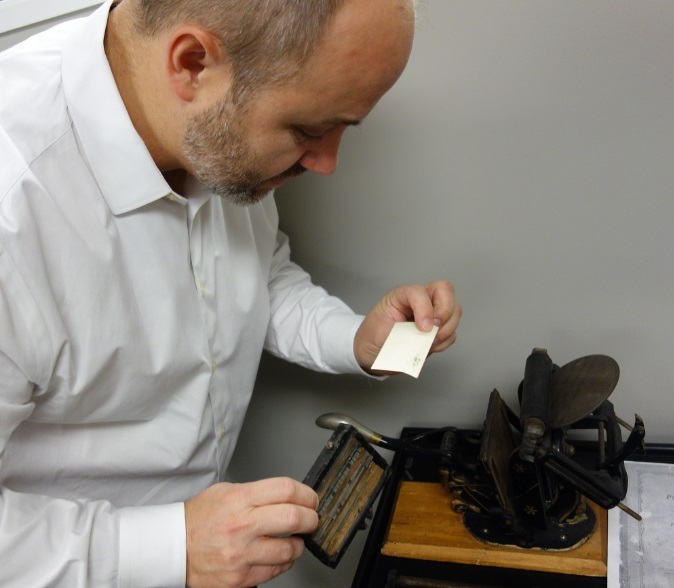 They were deliberately small, cast-iron convenience presses capable of printing no more than a few short lines on a paper card. At the tail end of the American Industrial Revolution these items were being sold new for one or two dollars each. The printer was always sold as part of a home printers' package that consisted of the press, an ink roller and a couple cans of ink. There was also a pair of tweezers and at least two boxes of type—all in miniature. Blank cards were available everywhere stationary was sold. Rail presses were produced until early in the twentieth century when they were succeeded by even lighter presses made of tin-plated steel and often quite gaudily decorated. The new tin presses came complete with lightweight rubber type included in the package - these flimsy rigs were not strong enough to accommodate printers’ lead or steel type. 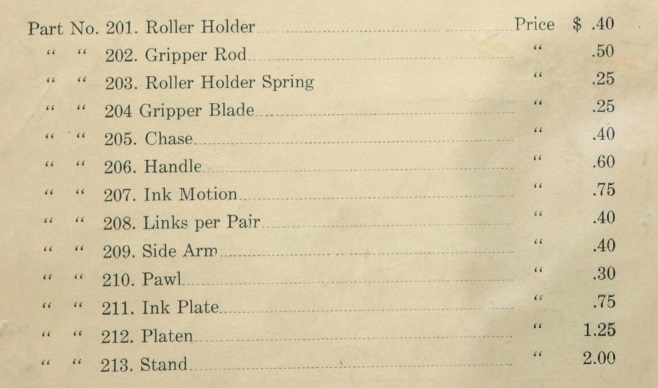 The #9 Printer is an early version of more successful rail press designs that came later - this machine was made of cast iron and came with good solid steel type. 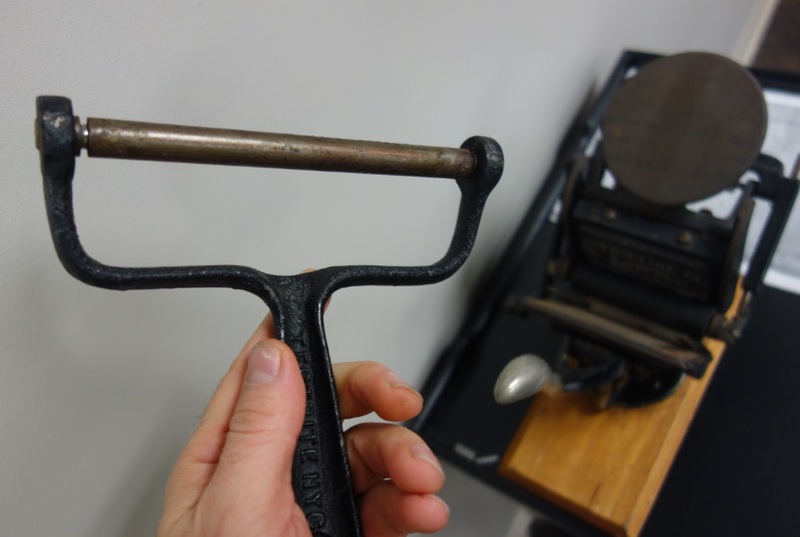 Spawned by America's rising demand for personal calling cards, the rail press was conceived as an alternative to professional printing. 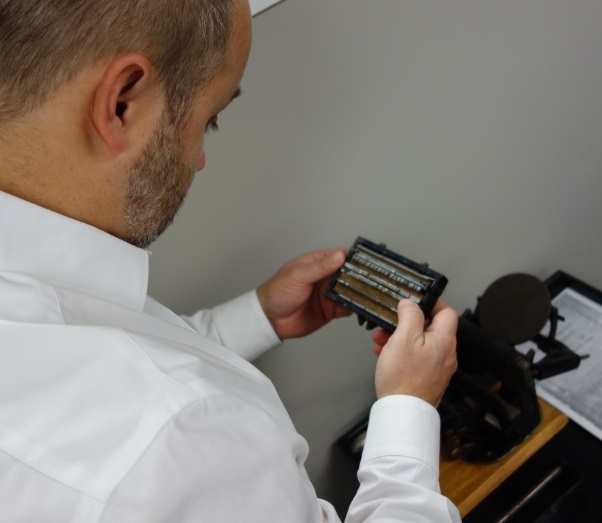 The marketing for other rail presses of the age appeals directly to businessmen for printing and numbering tickets, dating documents, and marking crates. 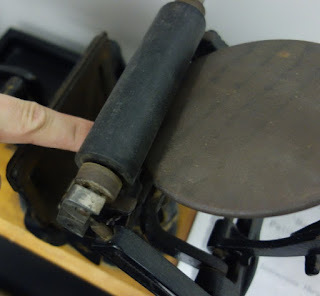 By the 1870s these small card presses were made not only for shopkeepers, but for amateur printers and eventually even for children. 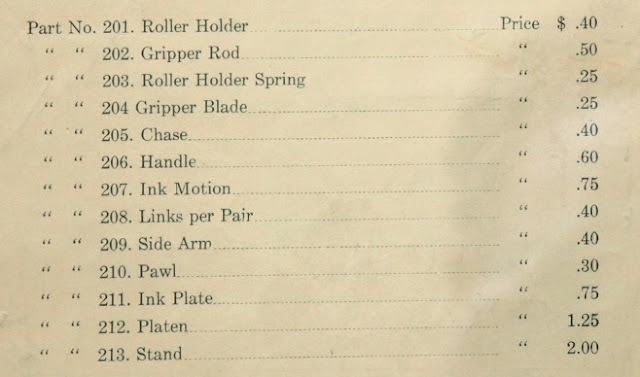 The tin and rubber stamp models on the market at the beginning of the 20th century probably cost about fifty cents each and did a horrible job printing anything. 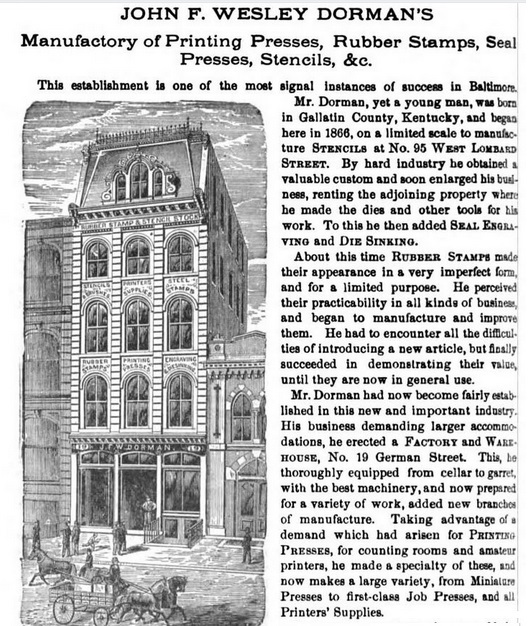 J. F. W. Dorman did NOT make Lorpon's antique; Dorman's firm produced a very popular range of hand lever presses that were closely copied by later manufacturers, notably Baumgarten & Co who also resided in Baltimore and also a man named Sigwalt who lived in Chicago. 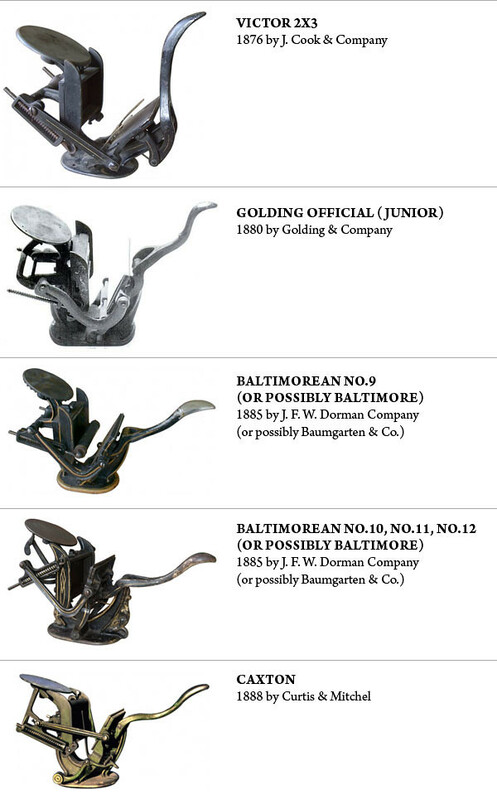 Dorman's Baltimoreans came first and were followed (copied) by Baumgarten's Baltimore No.9 and No.10 presses which are very similar with only minor differences in the casting and paint. The Baltimore #9 Printer on display at Lorpon Labels was made by Baumgarten & Co who copied the design by J. F. W. Dorman, as per Briar Press Museum website. 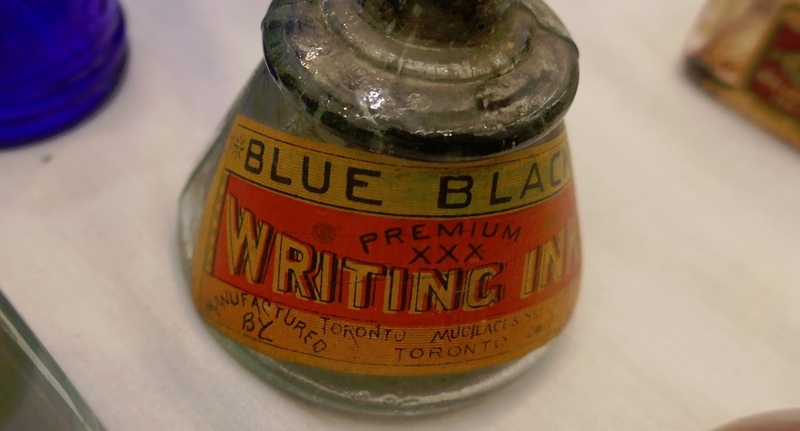 J. F. W. Dorman started in business in 1866 as a stencil cutter, becoming a supplier of rubber stamps and stationery materials. The company turned to making presses in the 1870’s. The Dorman hand lever presses were very popular and were copied by several other companies, but the only company that went by the name of Baltimorean, was the original Dorman press. The Dorman factory was lost to the Great Baltimore Fire in 1904. The catastrophe didn't stop this American Captain of Industry however and his name reappears a few years later as the source of an entirely different type of collectible - porcelain license plates. 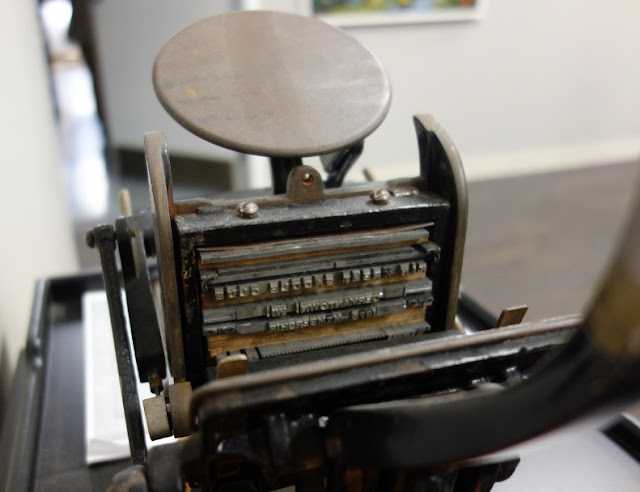 The Baltimore #9 Printer on display in the office foyer of Lorpon Labels was acquired by the Bob Pontarollo, CEO of the company in an antiques market in the USA for a couple hundred bucks, six years ago. That price was considered a bargain at the time. But what was the original catalog price? There doesn’t seem to be an online reference for the contemporary price of press that I can find today. If you know anything about it, please leave your knowledge in the comment section below. The machine was operated by hand lever. This item measures 10 1/2" by 5" by 8" tall is composed primarily of iron but is mounted on a slab of wood. Friedrich Koenig’s cylinder press debuted in London England in 1812 and was famously employed by The Times of London in 1814. Printing newspapers was where history was happening in the 1800s. American flatbed cylinder machines, following European models, made their appearance in the 1820s and became the workhorses of big city newspaper and large job offices. 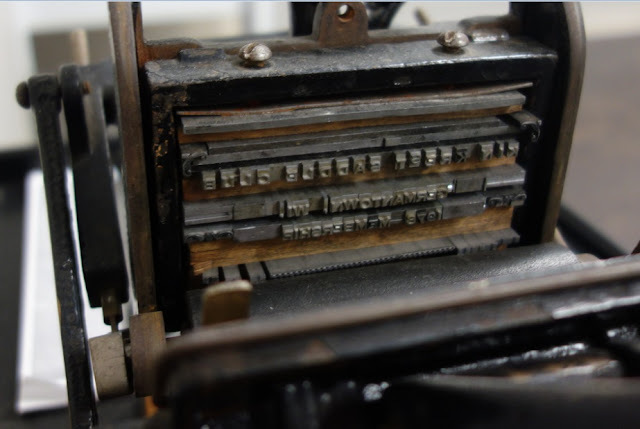 Type was still supported on a flat bed which had to move back and forth, but the impression cylinder could turn continuously, speeding up the paper feeding operation. Typically, flatbed cylinder presses delivered a thousand sheets per hour, printed on one side only. Koenig’s press was a huge breakthrough, and its impact on society is hard to calculate. From its first appearance in the Napoleonic era, the cylinder press has played a dramatic role in the march of civilization... And in another product category altogether, the little Baltimore #9 Printer was decidedly, a step in the other direction. Lorpon's Baltimore #9 Printer probably dates from the 1890's, but it could have been made as late as 1910. 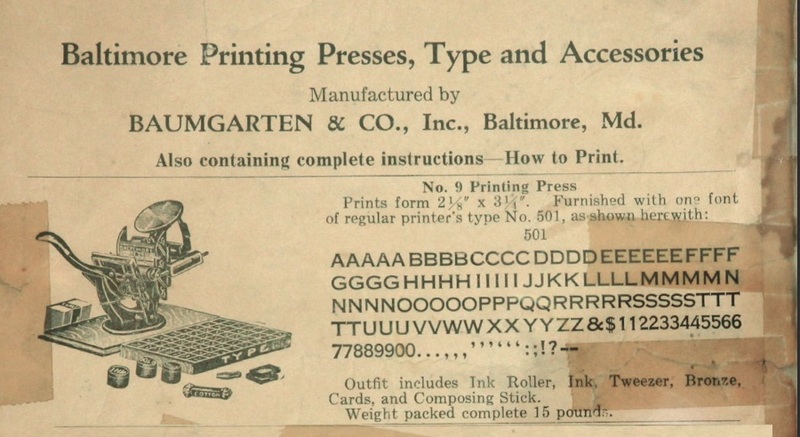 We know it wasn't made before 1885 because its not a 'Baltimorean #9 Printer'. As noted earlier, the original Baltimoreans were made by J. F. W. Dorman Co., but later Baltimores were produced by Baumgarten & Co., Inc. The castings, decorations and nomenclature were so similar that nowadays, two hundred and thirty years later, only veteran collectors can tell them apart. Without the accompanying text, could you spot the Baltimorean? Baltimore #9 Printer is indeed historic but not a trail blazer by itself. J. F. W Dorman was a pillar in the community , but not the only printer in Baltimore. 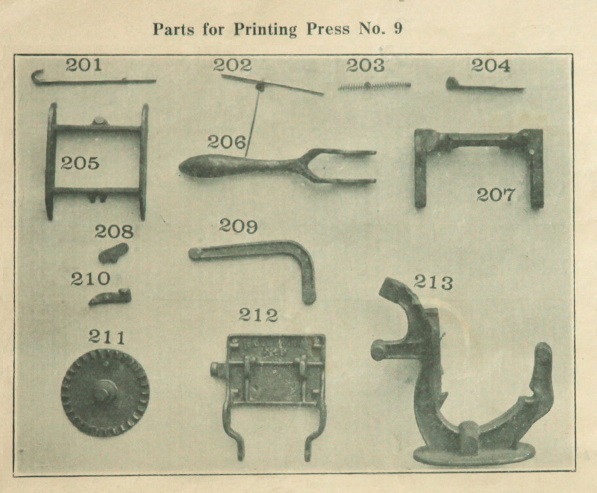 Baumgarten & Co. produced a line of presses exactly parallel to Dorman’s, but used the name Baltimore instead of Baltimorean, and made minor changes in the castings. By making these hand operated presses for everyday people, both businessmen helped clear a path for the march of humanity. 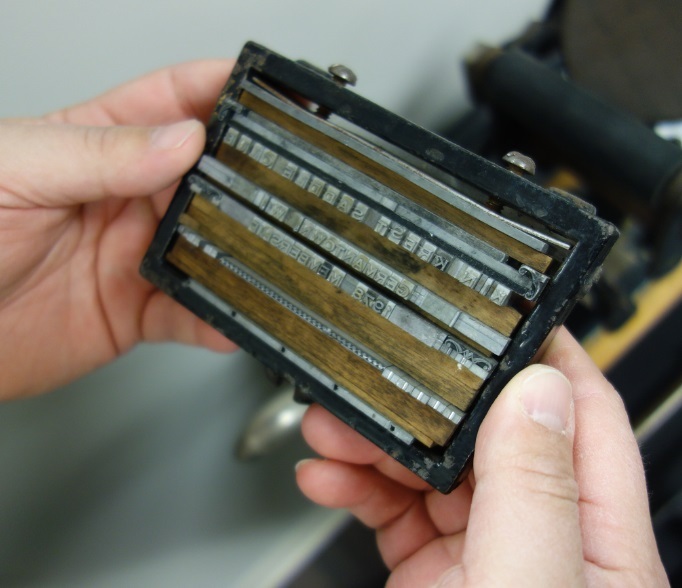 Today we can reflect back on how far we've come from inside the age of digital printing. Today we have full colour presses which are so good our paper currency has to be concocted from synthetic polymers and interspersed with translucent patches encasing magnetic stripes to deter counterfeiters. 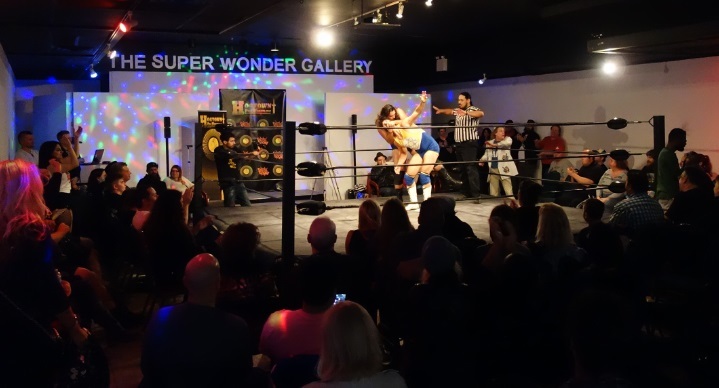 On Saturday night, Oct 1st 2016, Dumpdiggers attended an historic sporting event at the Super Wonder Gallery in Toronto. Dumpdiggers discovered heaps of collectible merchandise available for sale at the front of the venue. 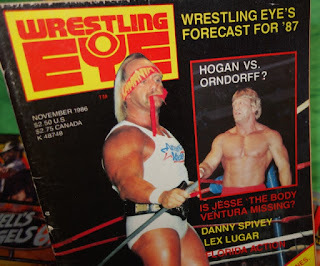 And after I pondered the treasures for a minute, I purchased some local Toronto wrestling posters because I was already infected with stories, the genre and the mise en scene of the historic occasion. 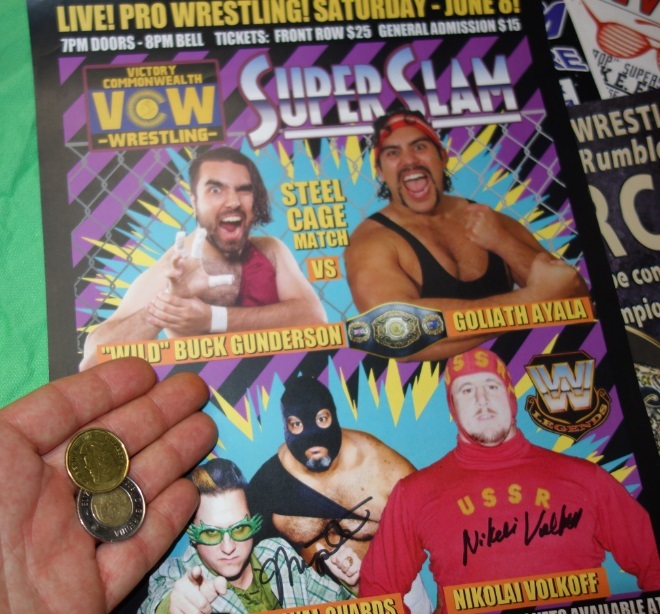 I paid three bucks each for two wrestling posters that were marked with the name of the previous wrestling league; VCW or Victory Commonwealth Wrestling. 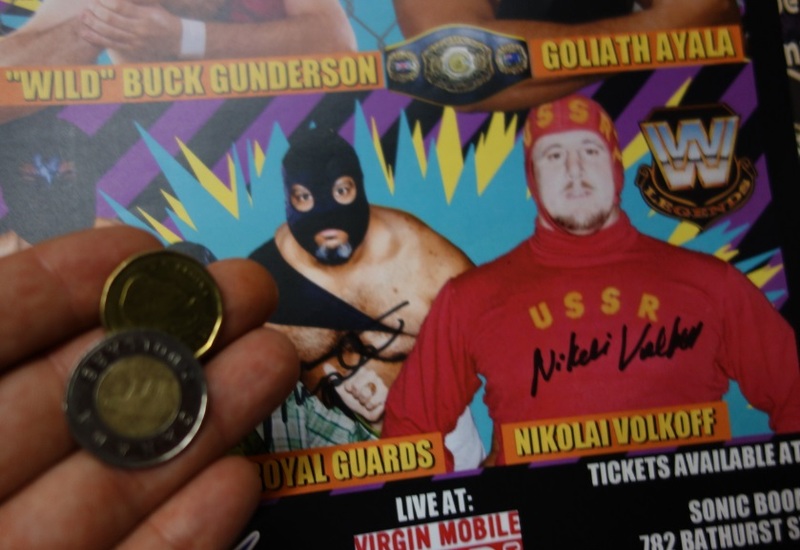 Click the pics and you can see the poster is signed by Nikolai Volkoff, the wrestler who was visiting from Russia. The man who sold me the posters informed me that Nikolai asked to sign the posters - it was his idea. He said that's how its done in Russia, and he's signs local match posters all over the world.I didn't think to ask if he'd won or lost the match? Perhaps someone could tell me in the comments? 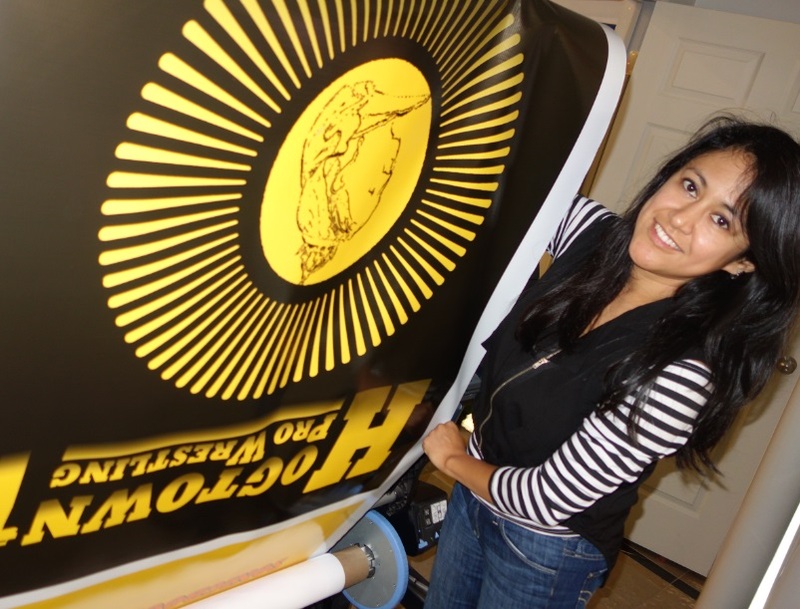 This image on Twitter shows the new banners for Hogtown Wrestling coming fresh out of the printer at a Toronto event signage company, Sign Source Solution. This is Toronto local wrestling kitsch, and it’s different from the mainstream professional wrestling merchandise because its just one step above ‘homemade’ and is issued in very limited quantities. I suppose if these items were pieces of wooden furniture they might be considered primitives. The same rules apply; the material made by these amateur artists is real and genuine and it looks good in your house. In this case, the two posters I purchased will line a closet where I keep gear near the front door, a man cave cubicle. I reckon the wallpaper job I'm doing there will survive me and endure for many decades as an impressive shrine to these local heroes. 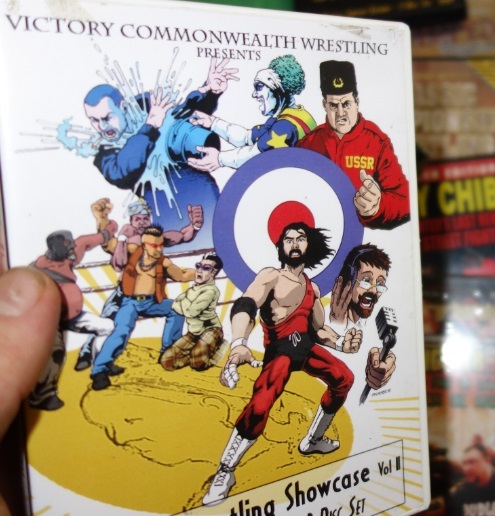 The local 'live wrestling' event posters and artwork on DVD box covers are made by promoters for small shows in downtown gymnasiums and fitness clubs, but what makes it valuable? Well to be fair, it really isn't that valuable today, however if one of these posters glimpses a movie star at the very beginning of his or her career... That is just one way this merchandise can accrue value. unique points of interest - i.e. are emblazoned with cheap prices, antiquated logos, phrases or long obsolete route map directions; such parchments can find other paraphernalia collectors who like to contrast present times with historic conditions. commemorate historic events. There’s more than one WrestleMania X7 poster and even some ticket stubs available on eBay, and there will always be a demand for more of anything related to that pinnacle event. Lots of historical significance for wrestling fans; that occasion is considered by some to be Wrestlemania’s greatest show (because the main event was a No Disqualification match between Stone Cold Steve Austin and The Rock for the WWF Championship. The undercard included Triple H versus The Undertaker, the second Tables, Ladders, and Chairs match for the WWF Tag Team Championship and a Street Fight between Vince McMahon and Shane McMahon). Having a relic from that event in your collection is a solid connection to greatness. have compelling stories. A good poster can be filled with unknown or long-since retired wrestlers and still have people asking ‘what happened?’ That's the power of a good story; when a poster can depict an archetypal hero in a match with a loathsome villain, it piques curiosity. From what I know about collecting merchandise in general and all I know about Hogtown Wrestling specifically, I’m thinking some of the material could be a good investment. Look here at this marvelous collectible celebrating a Toronto mayor Rob Ford look alike wrestler who offered another interesting perspective (satire) on local politics in 2014. Could one of these performers go on to become a big star like The Rock? or maybe enter politics like Jesse the Body Ventura? Buying merchandise with their names and personas is like making a small bet on their success. We all remember holding or seeing the Wayne Gretzky rookie card before it was worth hundreds of thousands of dollars. I hid one in my childhood bedroom because my uncle or maybe it was my Grampa told me that he was a 'once in a generation player'. Of course I can’t find that blasted card now, and that causes me great angst, and so its with the same apprehension that I walk by these tables full of athletic memorabilia and wonder about future demand for such niche stories and images, some signed by the performers, like the colourful character seen below; The Hacker meets his fans in person at each show to autograph posters and photographs. The Hacker won his match against Nick Watts, whom you can see wrestling Jim Nye the Science Guy above left. There were a lot of people cheering The Hacker's victory over Nick Watts and he was treated like a real celebrity when he appeared out front to sign autographs. 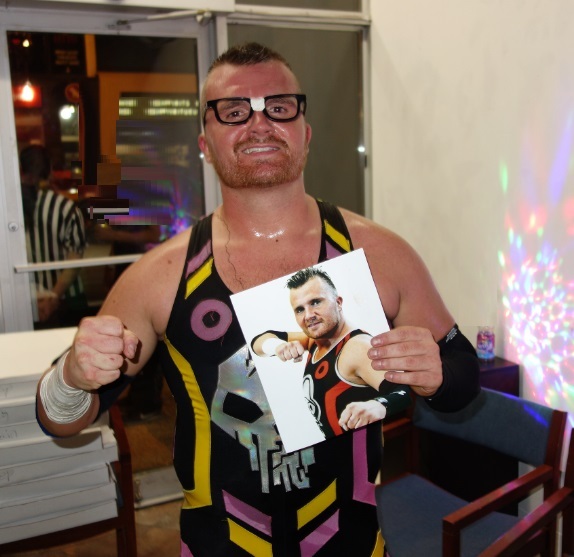 This charismatic good guy wrestler has a devoted fan base that wears his signature broken glasses at shows. I'm sure the people who write these stories are aware of his growing influence and will arrange his matches in such a way that he rises higher in the rankings. His character is riding high on gimmicks that have impacted the audience and given them something to remember - he becomes someone to cheer for, someone to care about. The Hacker's young fans will tell you the future of Hogtown Wrestling in Toronto is very bright. 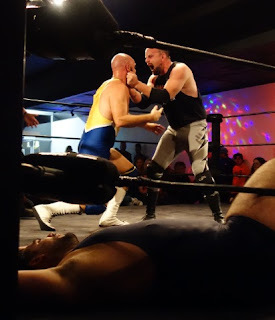 Is this the start of a Golden Age of local wrestling in Toronto, Canada? Let’s consider the 1980s wrestling 'boom' in the USA; the popularity of professional wrestling exploded in the 1980s due to the rise of pay-per-view and cable television syndication deals alongside the acquisitions and maneuverings of two notable promoters. Here in Toronto, Hogtown Wrestling has a Rogers TV deal and is working on improving their websites to carry short videos of individual matches. The wrestlers themselves are sharpening their social media skills to better push content on the website and promote their own appearance in the ring. The Golden Age of Professional Wrestling in the 1980s started when Vince McMahon signed AWA superstar Hulk Hogan to crown his enterprise 1984. To play Hogan's nemesis, he signed talents including World Championship Wrestling heel "Rowdy" Roddy Piper and AWA manager Bobby "The Brain" Heenan. My favourite was Hacksaw Jim Duggan who carried a sawed off 2x4 with him and would use it to clobber people, which I knew couldn't possibly be allowed in the rules, but I liked Hacksaw Jim Duggan anyway because he walked the fine line between loved and hated by the masses. You can see him squaring off with Roddy Piper in this DVD box cover on the left.Click the pic to see the full sized image. The DVD was for sale for five dollars which was the top end price for all the material on the table. Today you can buy all manner of Wrestlemania collectibles on eBay and most have Roman numerals so long it would take me a minute to work out the number. The first Wrestlemania was 1984 and WrestleMania VI on April 1, 1990, is acknowledged as the end of the 1980s wrestling boom. The event saw one of the last WWF appearances of André the Giant. Anything connected to those first six shows are solid gold today. 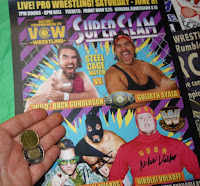 I believe the commercial success of The Wrestler movie also helped wrestling get started again in Toronto. The film received universal critical acclaim and won the Golden Lion Award in the 2008 Venice Film Festival in August. I mention this because it was the hero's story that captivated audiences and not the wrestling really, although that was excellent. And this is what I see occurring in this league and other sports theatre operations in the city - its a new and wonderful place to tell poignant stories about ourselves. And it spawns a myriad of collectibles to chronicle our times.